Eat your heart out, Bruce Wayne: Now everybody can have their very own Alfred. The folks at Running with Crayons have officially released version 1.0 of their launcher utility. The program was released as a beta back in March of 2010, and since then the developers have been beefing it up with additional features and capabilities. In addition to launching apps, the free version offers many of the same abilities that you’ll find in competitors like Butler, LaunchBar, and Quicksilver. For example, you can search your Mac, search the Web, create custom Web searches for sites like Wikipedia, look up word spellings, perform calculations, and even issue system commands. Running with Crayons also offers additional features via the Alfred Powerpack, available only from the developer’s site. The add-on, currently £12 (about $19) adds more powerful capabilities, such as the ability to run shell scripts, AppleScripts, and Automator Workflows; global hotkeys that allow you to launch apps or open documents with a keystroke of your choice; filesystem navigation; an iTunes mini player; clipboard history; the ability to create emails; and more. The Powerpack may eventually be available in the Mac App Store, but in a blog post earlier this year, Running with Crayons said it’s waiting to see how the effects of Mac app Sandboxing shake out. 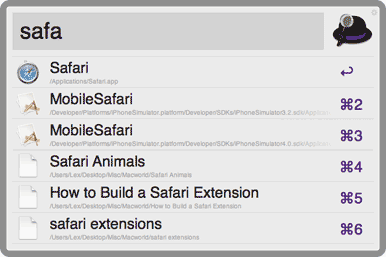 Alfred 1.0 is currently available for free from the developer’s site; it should appear in the Mac App Store soon. The software requires an Intel Mac running OS X 10.6 or later, with 10.7 recommended.